Our CALL CENTER, active day and night, is the company’s organizational command center, controlling the entire service-request network and managing the fleet of chauffeur-driven cars, buses and cargo vehicles according to customer demand. 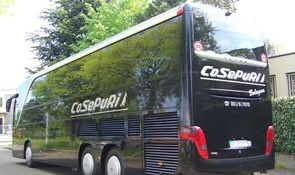 COSEPURI can also handle requests that are more complicated transportation situations, such as conventions, and other large, public events held anywhere in the country, providing on-site assistance with specially trained personnel in charge of coordinating passenger transport and organizing the required bus and private transfers by car as well as any associated transport of material. 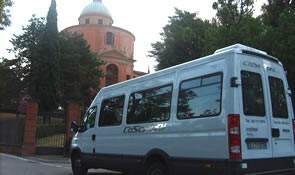 The company is divided into 4 Operating Units: CAR DIVISION, COACH DIVISION, FREIGHT DIVISION and BUS-SERVICE DIVISION. The FREIGHT DIVISION consists in a fleet of 85 late-model vehicles of up to 1600 kilograms, insulated, refrigerated, equipped with hydraulic tail lifts, driven by reliable personnel to transport your goods/documents/food/ pharmaceuticals in accurately controlled temperatures, in accordance with HACCP regulations, anywhere within Italy or abroad without intermediaries or any contact with other materials. Any goods we transport are insured during each, individual transport, against damage, robbery or theft for the entire time period from the moment of pick up to delivery at their destination. Our goods and archive document storage services are an ideal solution for clients who want to free up some space. Their material is stored in specially structured areas which are constantly monitored. 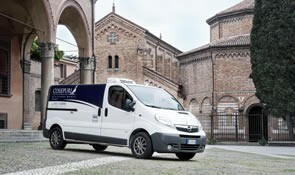 The BUS LINE SERVICE DIVISION handles local public transport services in and around the cities of Bologna and Ferrara, for the TPer transit company of Bologna and the TPF of Ferrara, running over 3.9 million kilometers a year. The scheduled bus lines we handle are predominantly those with lower passenger numbers. Our competence and experience allows us to keep them running thanks to our ability to keep costs down and increase the number or passengers, which is clearly beneficial to the public.